Swiss Post wants to move even closer to its customers – with traditional and new services. Post offices, letter boxes, Postomats, apps or websites: all access points at a glance. In 2015, Swiss Post also launched a range of pilot projects and invested in existing infrastructures. Post offices, postal agencies, home delivery services: Swiss Post today operates a nationwide network of 3,500 access points. In the future, it plans to develop even more time- and location-independent services. People have become more mobile – both at work and in their free time. That's why Swiss Post aims to be exactly where its customers are, with the right products and services at the right time: physically on the ground, virtually on the Internet and mobile on smartphones and tablets. No driving, no queues, no opening hours: Swiss Post offers many ways to take care of postal transactions wherever and whenever it suits you, on the web and with handy smartphone apps. New access points, services, opening hours and a reorientation of Customer Service: in 2015, Swiss Post launched a range of pilot projects with the goal of getting closer to customers. 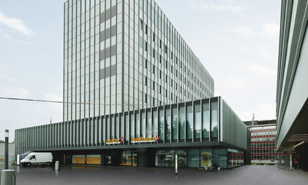 Two of Switzerland's largest post offices have been reopened: the Sihlpost building in Zurich and the post office at the PostParc center in Berne. They are spacious and modern, and they're open to customers almost around the clock. You see them at petrol stations, motorway service stations, in shopping centers, in universities and in front of post offices – the practical and convenient My Post 24 terminals, where customers can collect, drop off and return parcels and registered letters 24 hours a day, 7 days a week. For customers who spend a lot of time on the move, PickPost is the ideal solution. With this service, customers choose when and where they want to collect each and every parcel. customers come into contact with Swiss Post every day. calls were answered by Customer Service in 2015.
people visit the Swiss Post website every day. people follow Swiss Post on social media channels. is the number of times Swiss Post's apps have been downloaded so far. francs represents the revenue generated by third-party products in post offices in the last year.